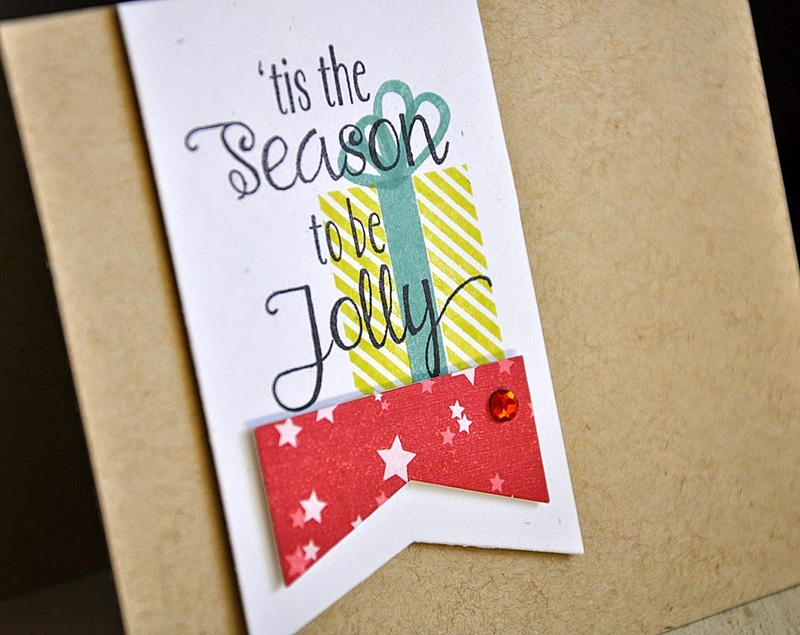 Thanks for joining me today for this weeks Papertrey Ink Design Team Tip! 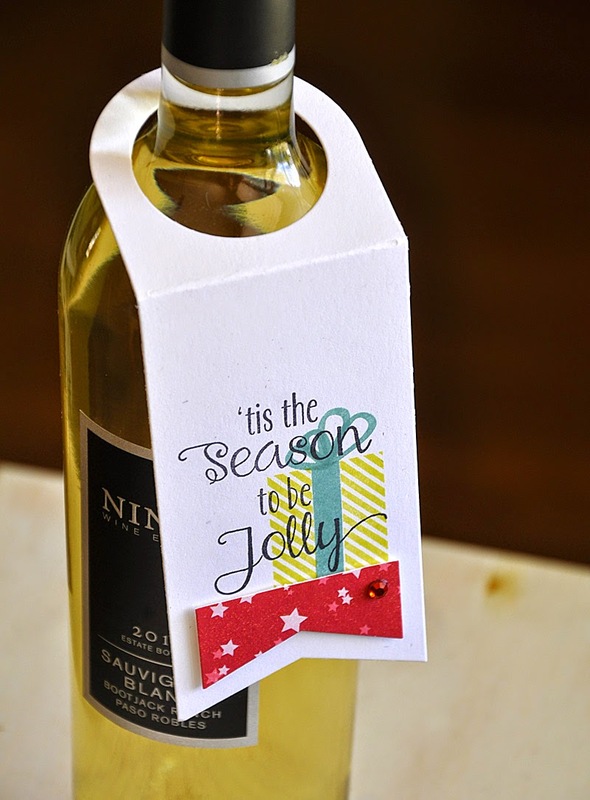 The Wine Bottle Tag can beautifully dress up a gift of wine, but that's not all it's good for. 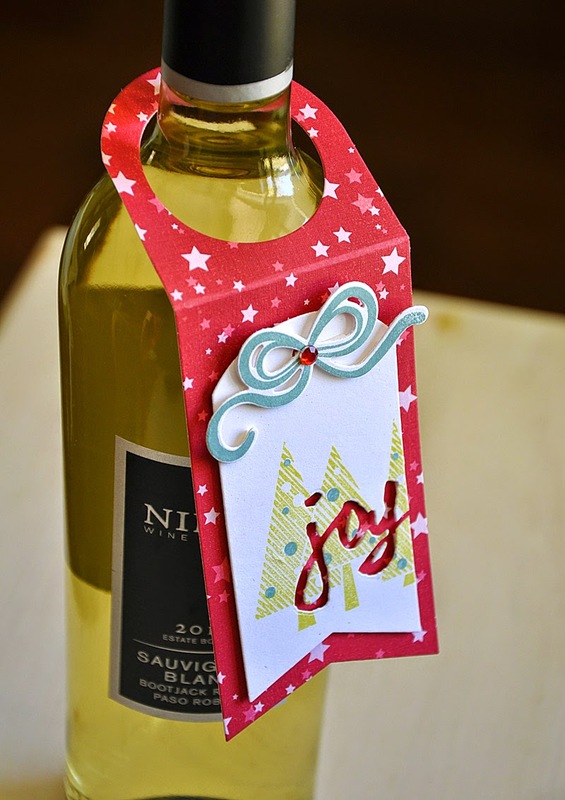 I've used it for other projects too... to decorate table napkins, bottles of teriyaki sauce, waterbottles, as hanging gift card holder, and even as door knob hangers. My hope for today is that you too will become aware of just how useful this simple die truly is! 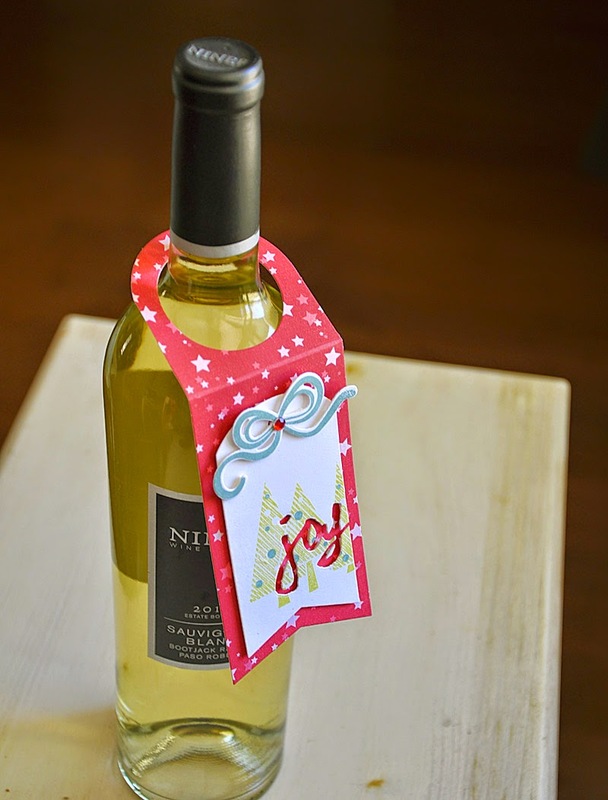 One of my favorite ways to decorate the wine bottle tag is to pair it with the Tag Sale #5. Which I've layered together for my first wine bottle sample. 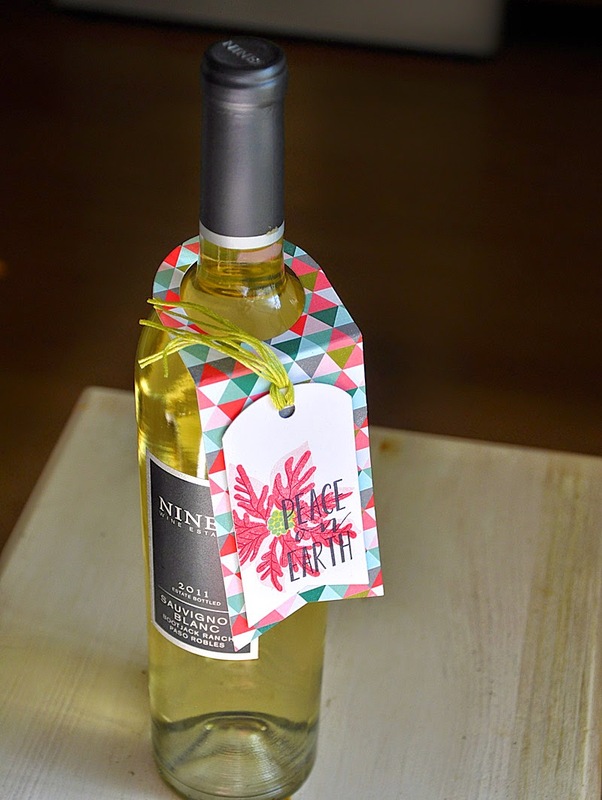 The wine bottle tag was die cut from pattern paper found in the MakeIt Market Kit: Tinsle and Tags. 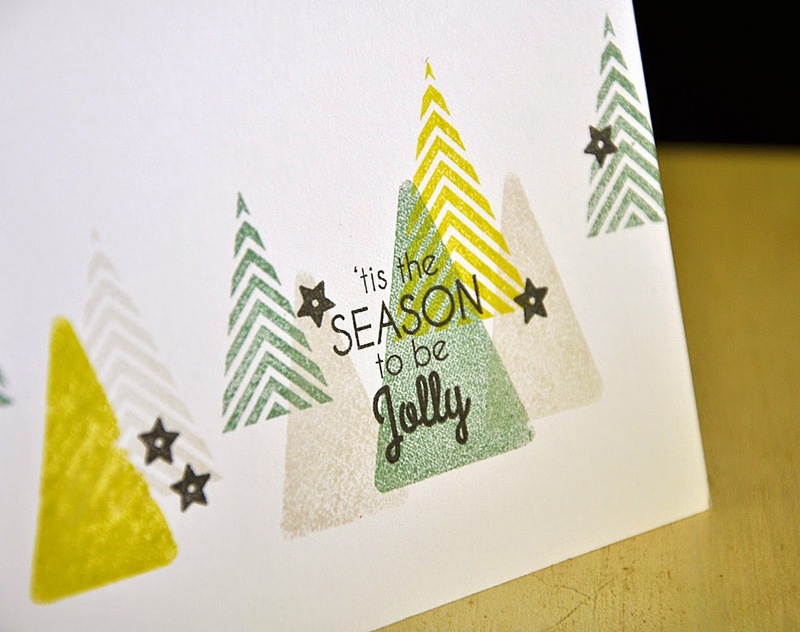 The tag sale #5 was die cut from rustic cream cardstock, stamped with trees from the Holiday Cheer stamp set and then die cut again using a Wet Paint Holiday die "JOY". Then finished off with a bow (also from MakeIt Market Kit: Tinsle and Tags) and a rhinestone. 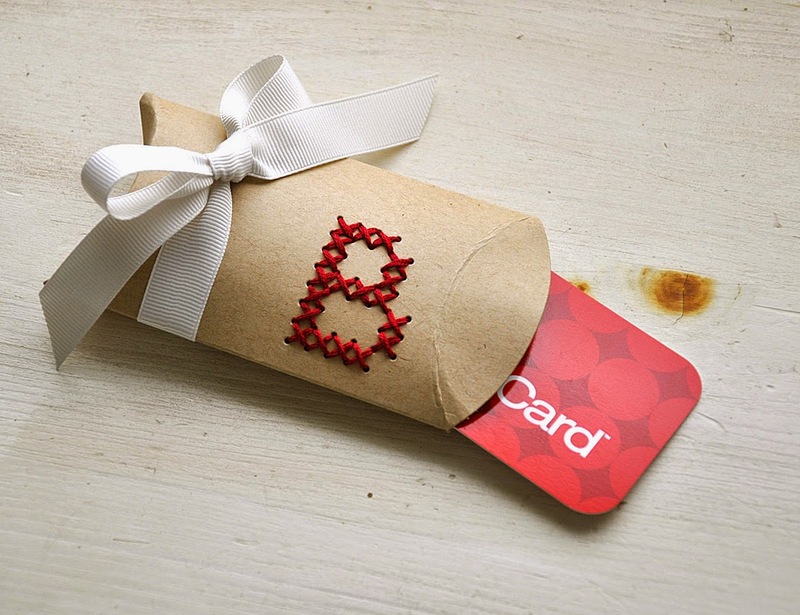 But it's also great on cards! 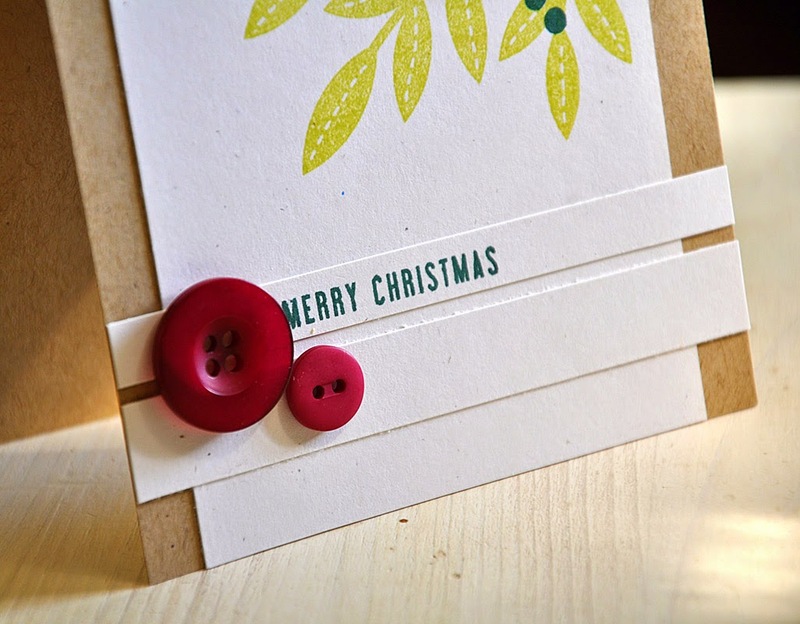 Makes creating clean and simple Christmas cards a cinch! Simply trim off the top edge and attach. Again I've paired it with the tag sale #5 die, but this time only the bottom portion was used. 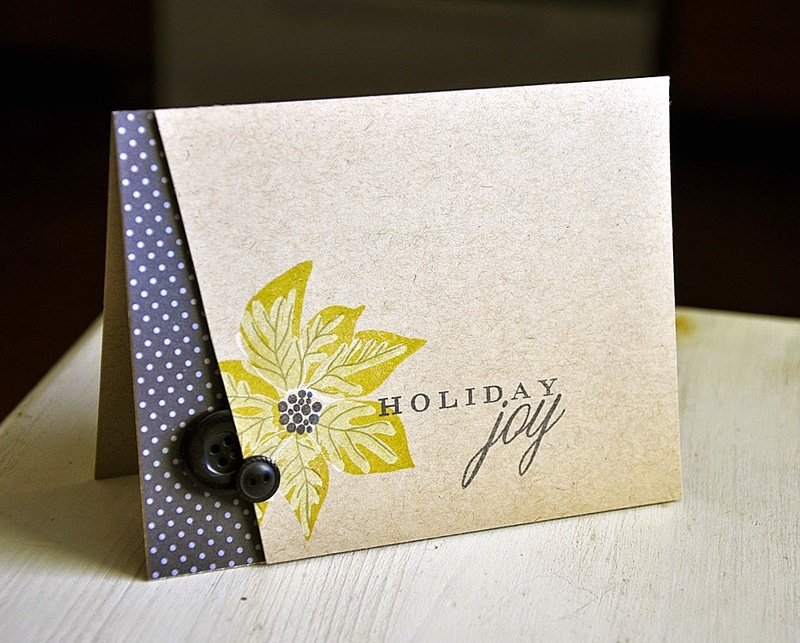 The tag edge was topped with a stamped gift (from the Jolly Holiday stamp set) and a sentiment (from the 'Tis the Season Sentiments stamp set). 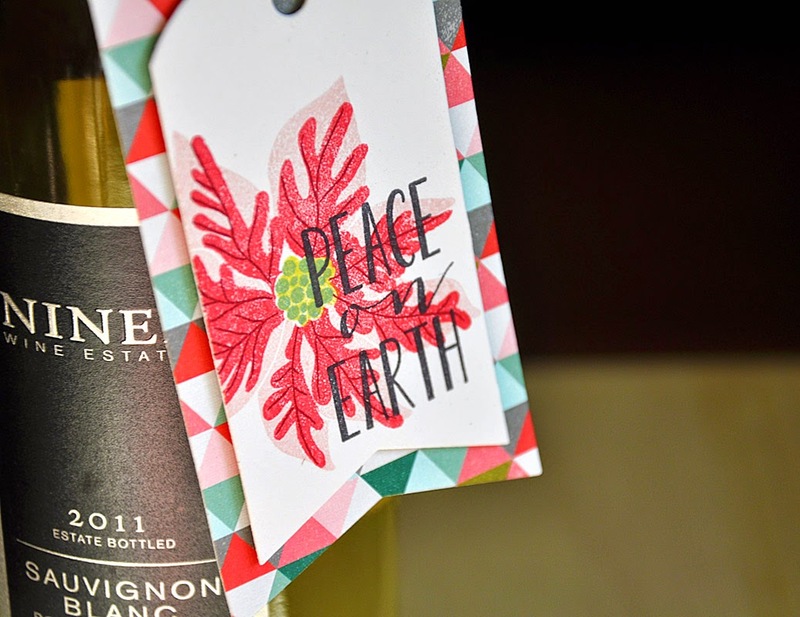 I've got one last wine bottle tag to share with you. This one is my favorite. 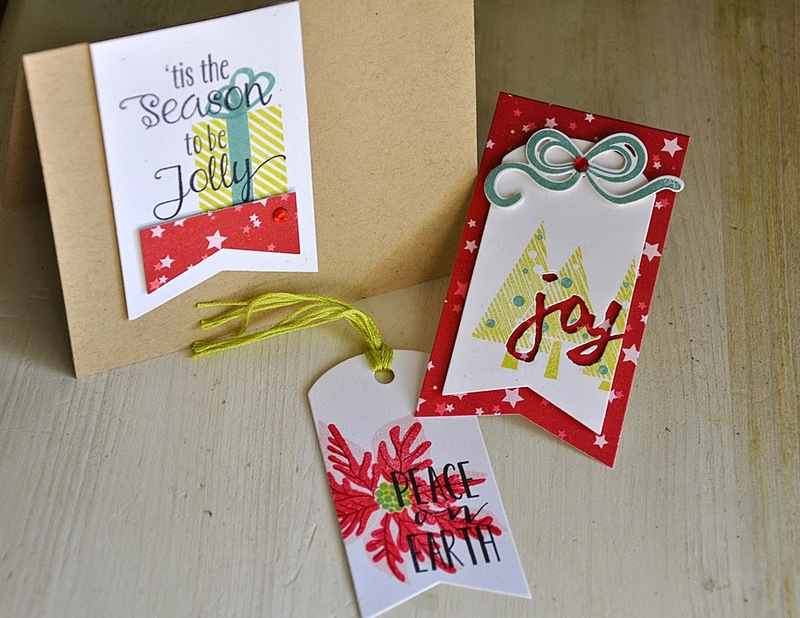 The pattern paper is from the MakeIt Market Kit: Tinsle and Tags. 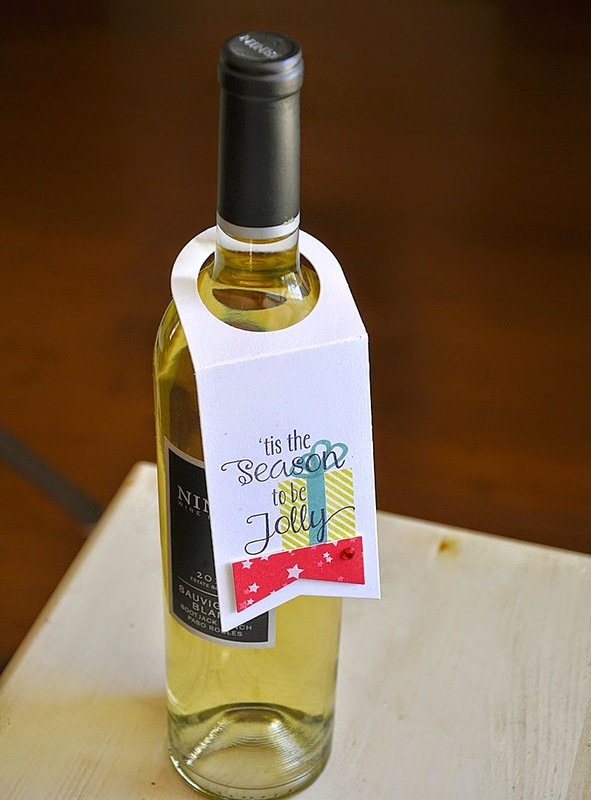 I wanted to share with you how cute it would be to create a matching wine bottle tag and gift box tag. Coordinating the two shows off a gift ensemble perfectly. 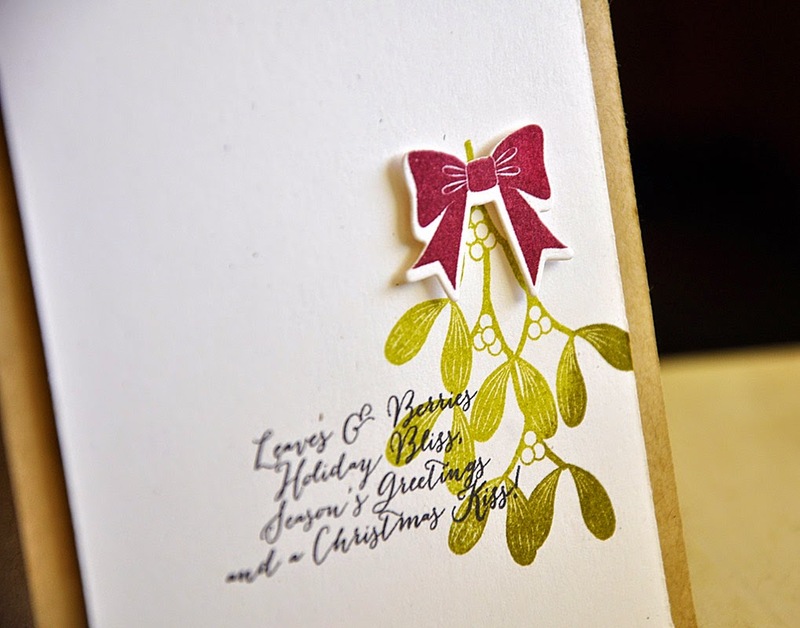 I just love this poinsettia (from the Painted Poinsettia stamp set) stamped in a color combo of sweet blush, pure poppy, scarlet jewel, limeade ice and ocean tides. 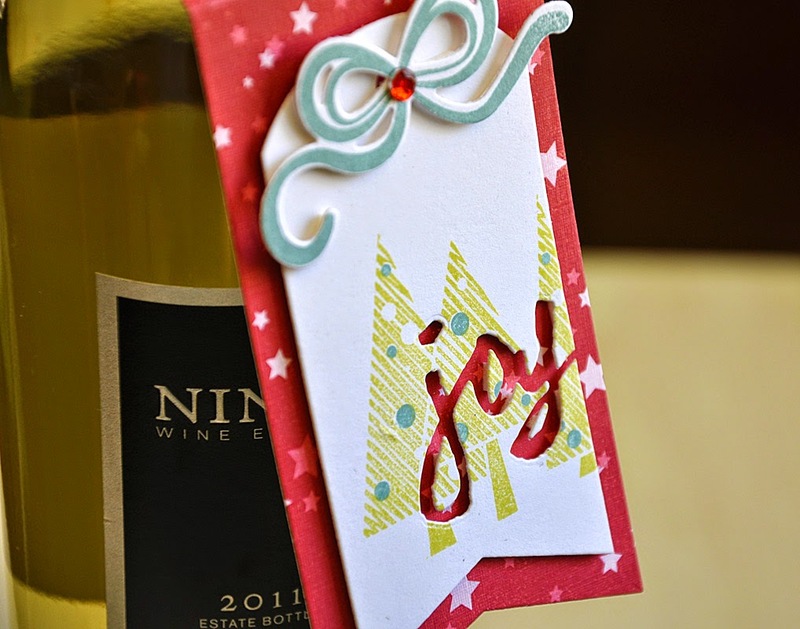 One last look at just a few project possibilities available when combining together the Wine Bottle Tag and Tag Sale #5 dies. So what do you think?! 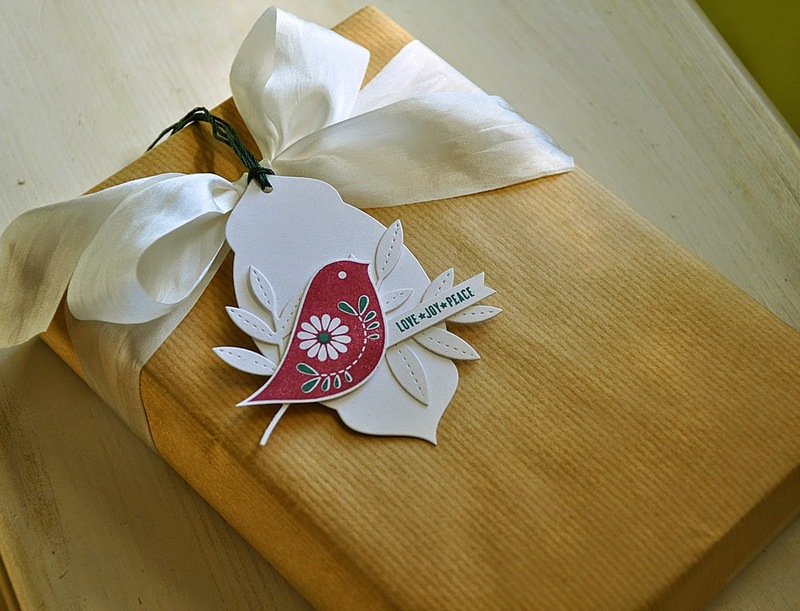 Could this become your Christmas wrapping of choice this year? I sure do hope so! Well, that's it from me today. 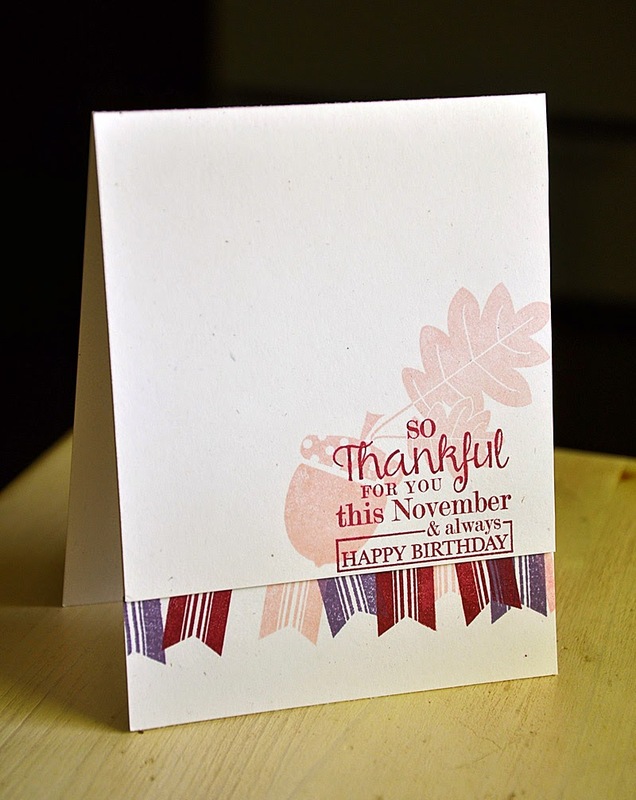 The Papertrey Ink October countdown is about to come to an end and I'm here to share my final projects with you today. But, before I do, let me remind you that everything you've seen peeks of will be available for purchase through Papertrey Ink beginning 10 pm EST tonight. Phrase Play #8 designed by Nichole Heady. The snowflake trails are from Freshly Fallen designed by Lizzie Jones. 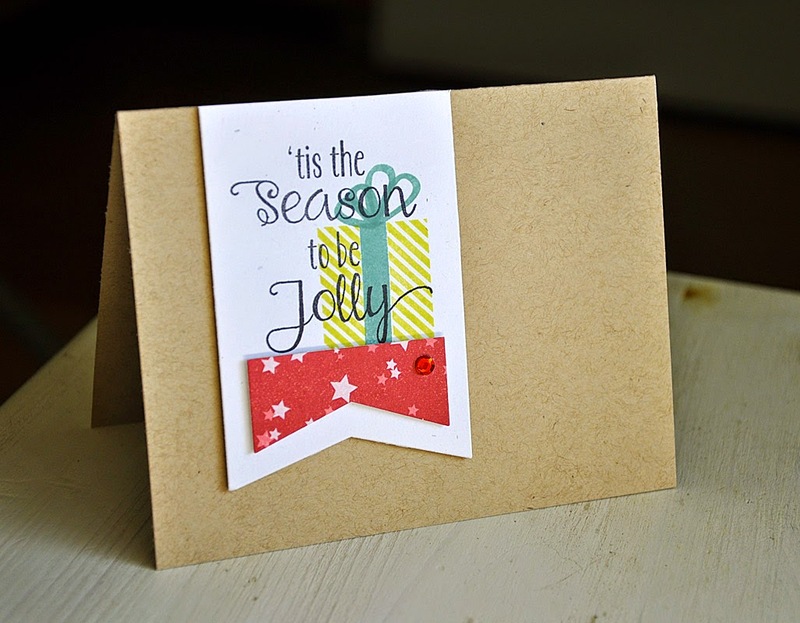 Jolly Holiday designed by Melissa Bickford. 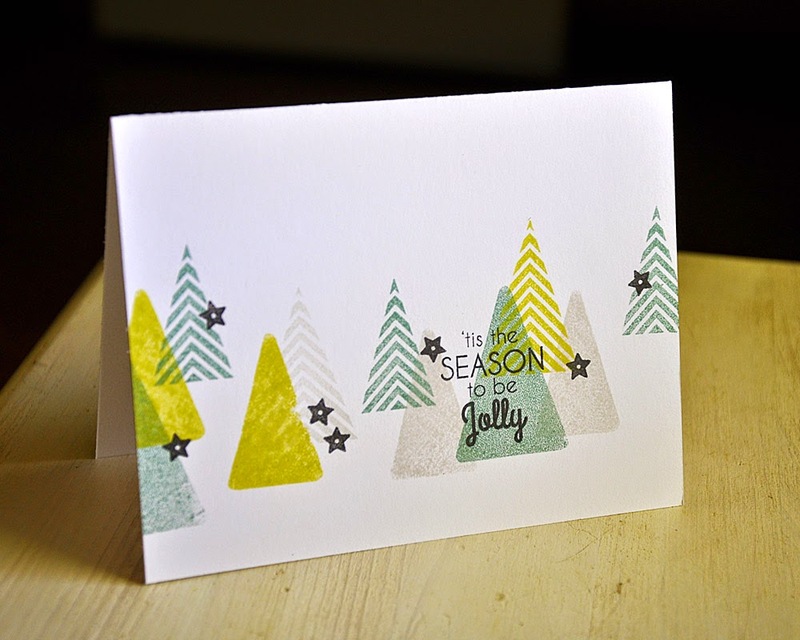 I used the reverse side of the tree stamps for the solid shapes. 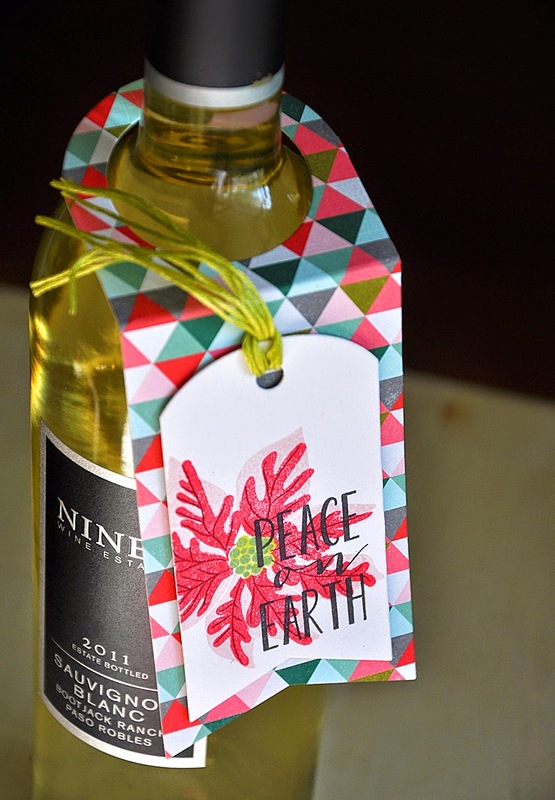 Painted Poinsettias designed by Nichole Heady. 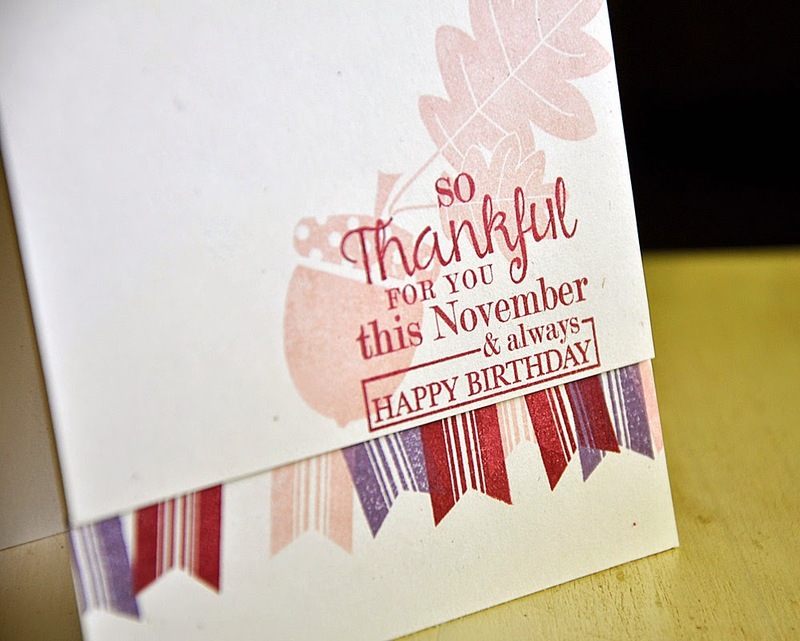 Birthday Classics: November designed by Dawn McVey. 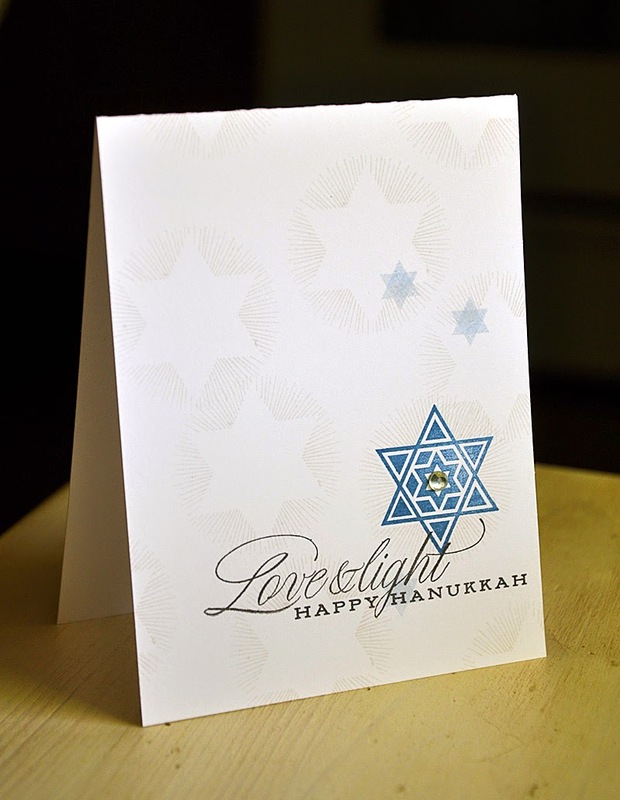 Festival of Lights and Keep It Simple: Hanukkah designed by Nichole Heady. 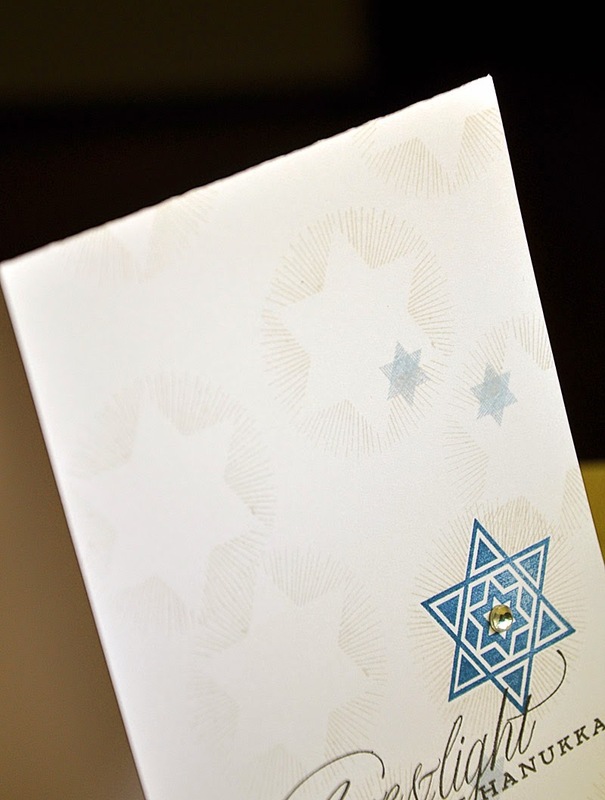 Might be a bit hard to see, but the star circle border was stamped repeatedly in soft stone all over the card front. Another shot of the stamped background. Merry Kiss-mas designed by Lexi Daly. A little Rock and Roll Technique applied to the mistletoe. Welcome to the final day of the Papertrey Ink October countdown. Thanks to today's product feature I have my Christmas gifts and wrappings already planned out for this year. I'm fairly certain that after viewing today's project selection (brought to you by the design team) you will too! 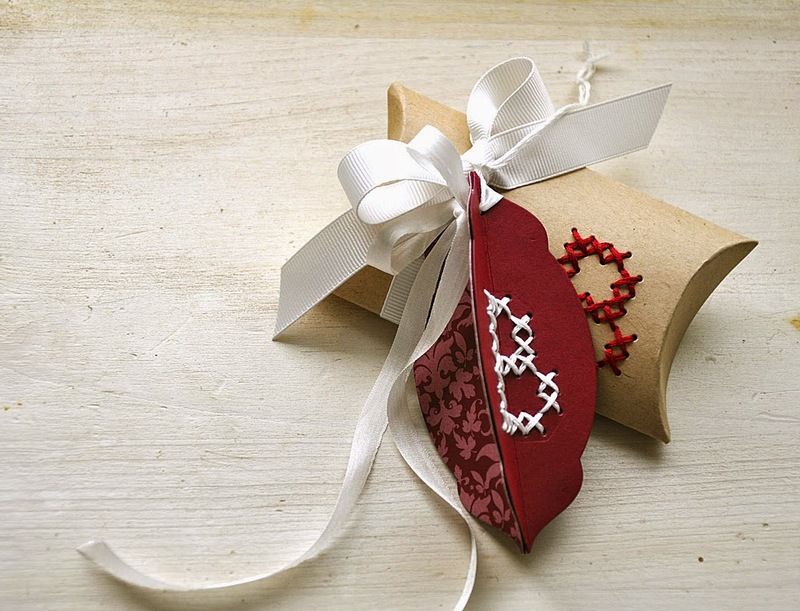 My first gift ensemble focuses on the Canned stamp set and coordinating dies. 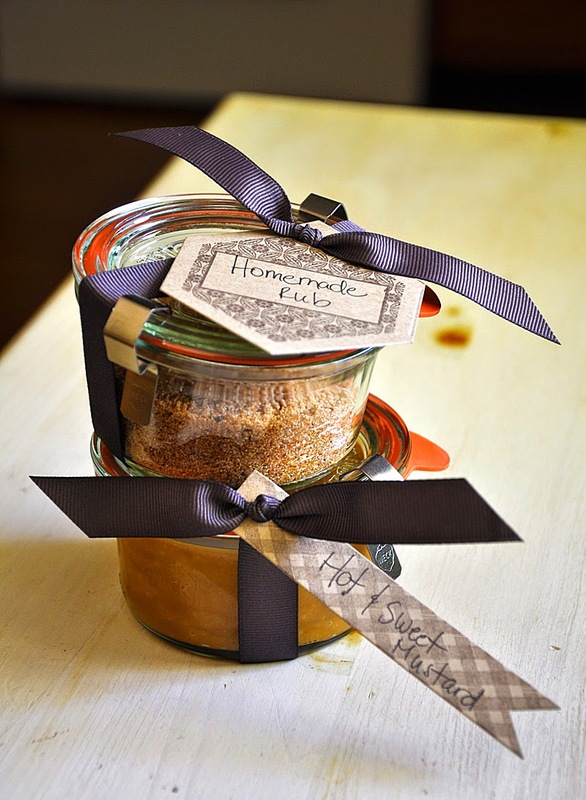 I've never canned anything in my life, but I still absolutely love all Weck canning jars. 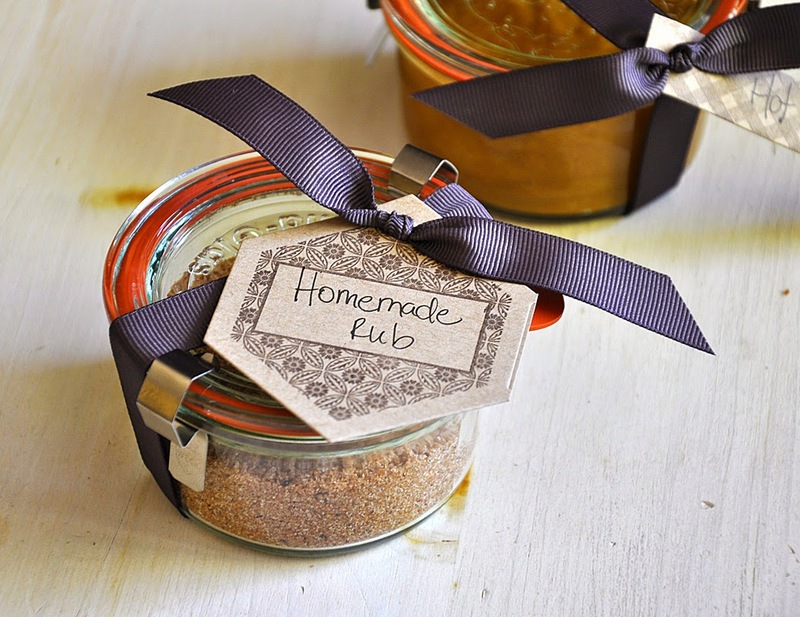 I am so excited to share my love for them this year by filling them with homemade mustard and meat rub. No canning involved, just fill, cap, decorate and refrigerate. Easy peasy! Here are the jars I used, size #976. Mustard recipe found here. 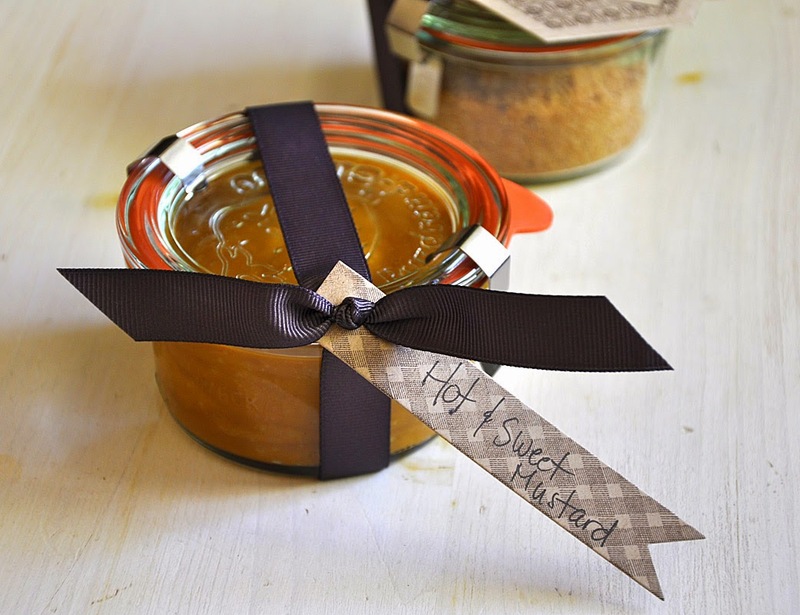 I kept the wrapping simple to let the jars and the contents take center stage. 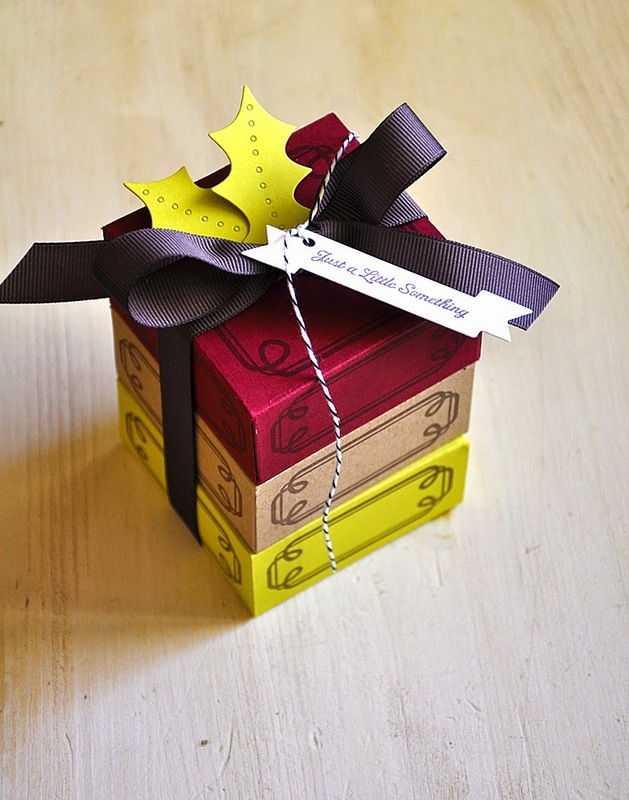 I simply wrapped with smokey shadow ribbon and tied the ends through the hole I punched in the banner style die cut (included in the Jar Bonnet die collection), which was stamped with the coordinating strip stamp in smokey shadow ink. 1/4 C brown sugar, 1 tsp fresh cracked pepper, 1/2 tbsp salt, 1/2 tbsp garlic powder, 1 tsp smoked paprika and 1/2-1 tsp chipotle chili pepper (depending on how much heat you like). 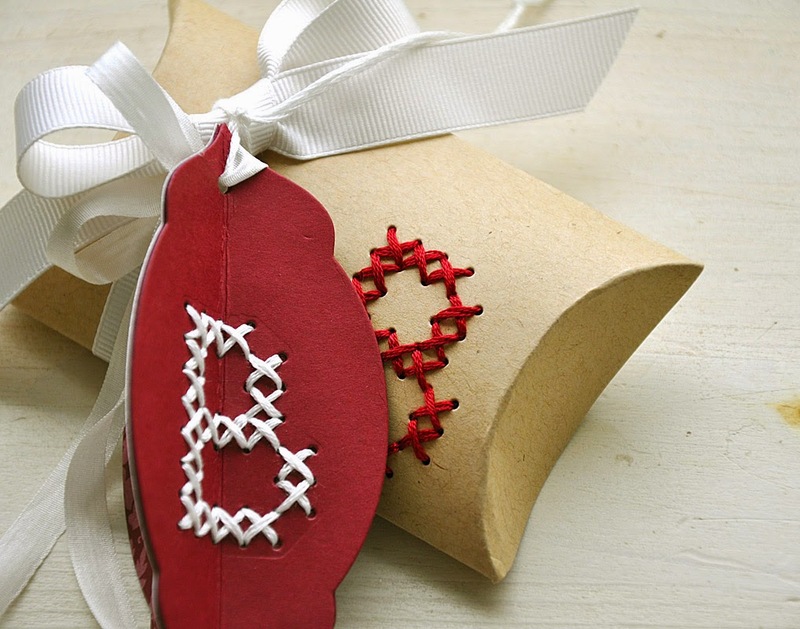 My second ensemble is a pillow box and ornament tag combo, created using the Cross Stitch Alphabet dies and Cross Stitched stamp set. 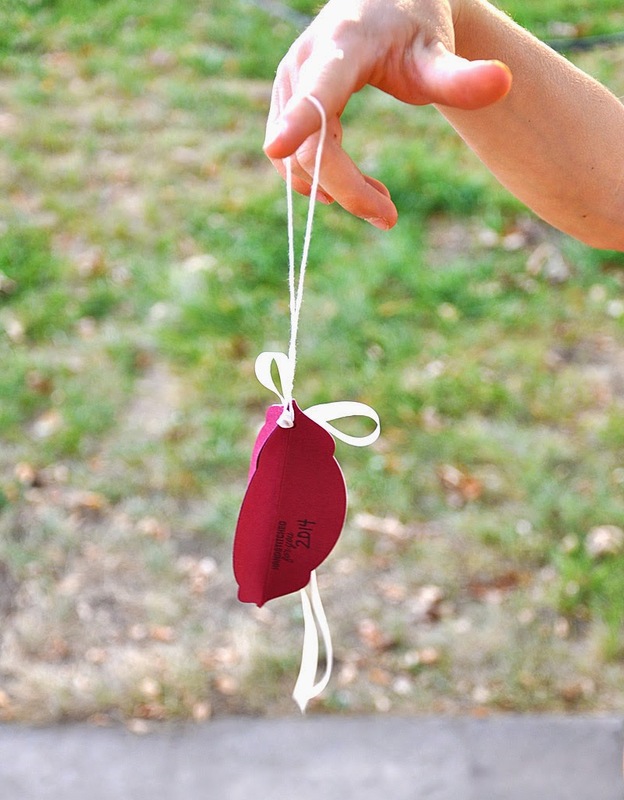 Each include a hand stitched monogram. I'm sure most of you know by now, but the Essential Pillow Box is perfect for gift cards! 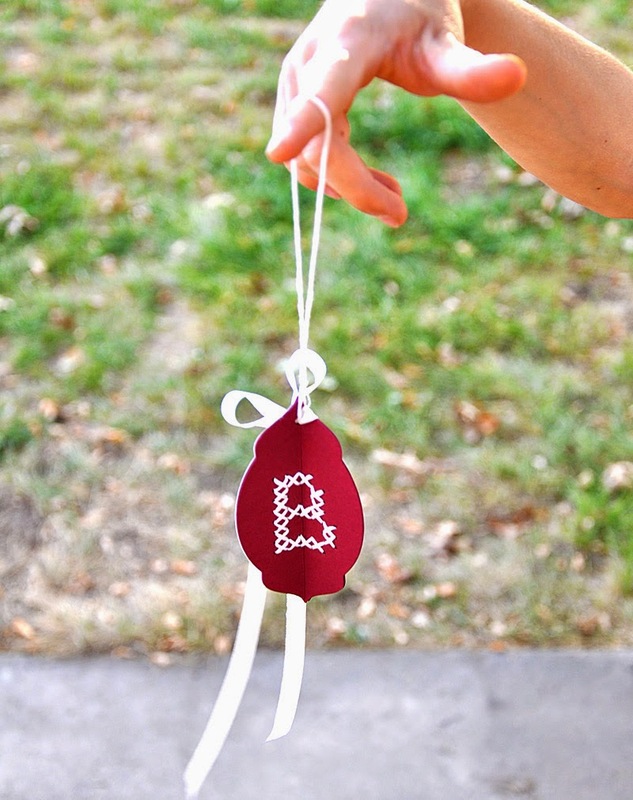 Here's a nice shot of the stitched monogramming and the bow tied from soft stone grosgrain ribbon. Here's a shot at how the ornament started out. 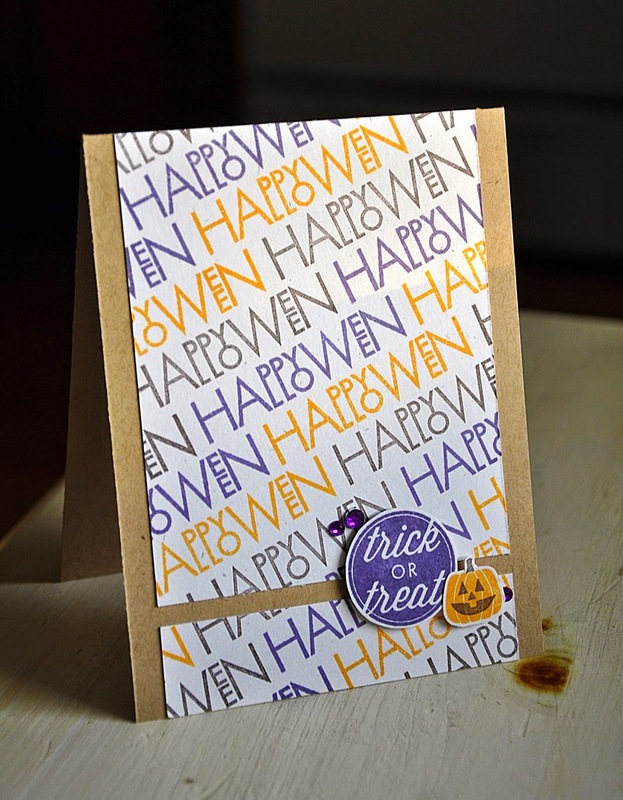 I used the label shape die (included in the Jar Bonnet die collection) and die cut three times from scarlet jewel cardstock and once from matching pattern paper. Using a 1/8" hole punch I punched through all four pieces at the same time. Scored down the center of each of them. Stitched one, dated and signed (if you prefer) another and attached the final two together. Using a strong adhesive (I like these and these!) 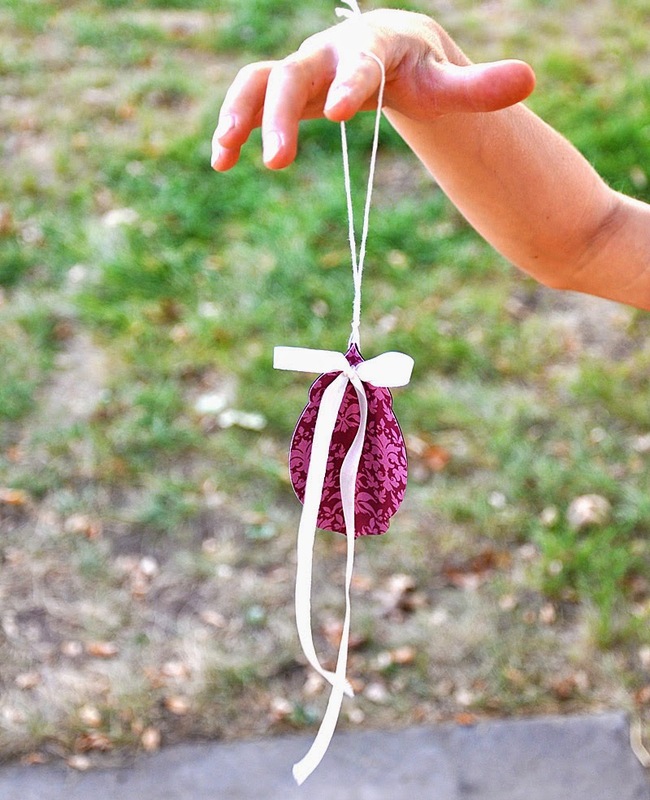 I attached all three side together, strung floss through the holes to create the loop for hanging and finished it off by threading 1/4" silk ribbon through the holes and tied the ends together on the pattern paper side. 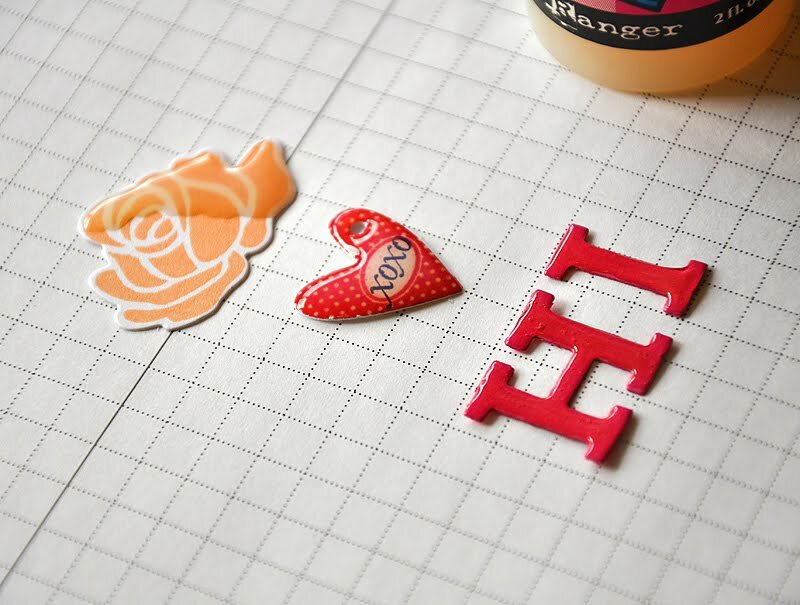 The "Handstitched for You" phrase is included in the Cross Stitched stamp set. This side is perfect for writing a person message to the receiver, would work best if you could do it before assembling. 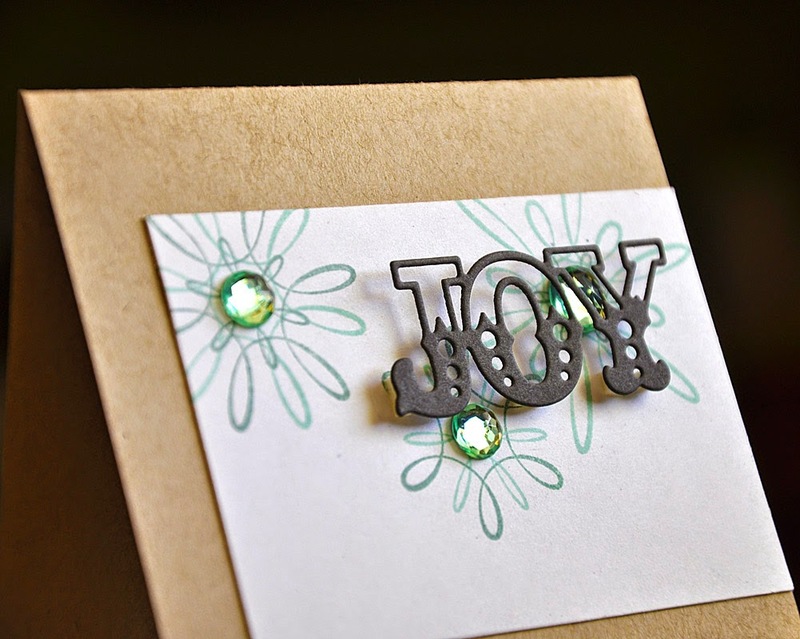 My final ensemble uses the Vintage Favor It Box die and coordinating Just a Little Something stamp set. Inspired by this photo, I chose to create a limeade ice, kraft and scarlet jewel box stack wrapped with smokey shadow ribbon. 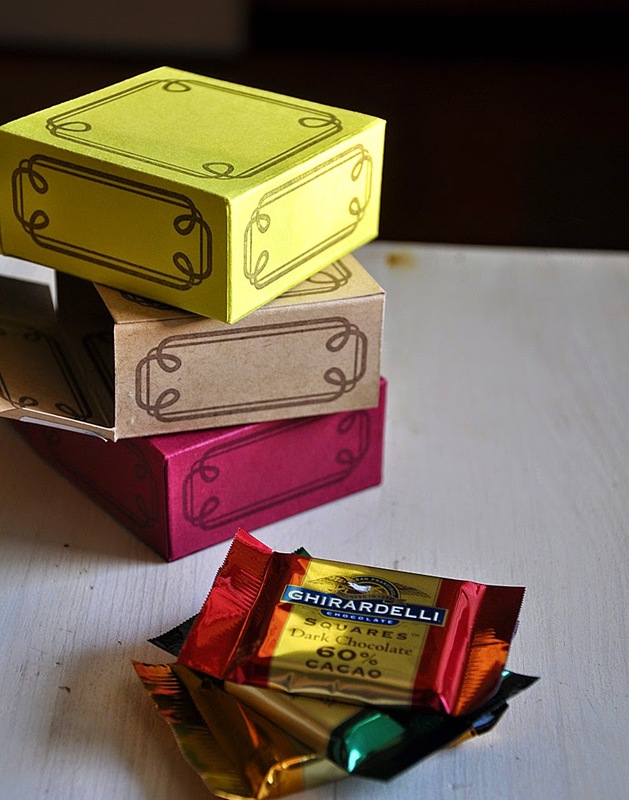 Each box fits four chocolate squares perfectly. 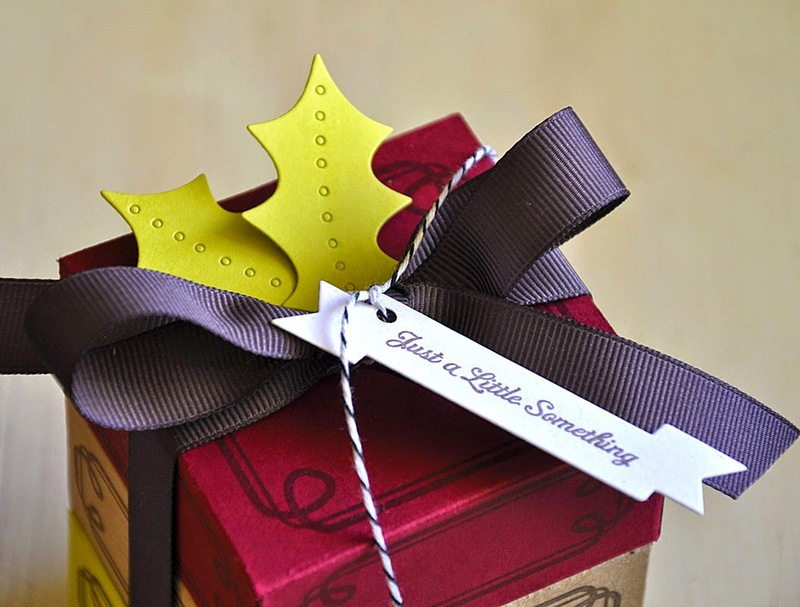 Topped the boxes off with a couple holly leaves (die cut using dies from the Seasonal Stitching die collection) and a banner (created using the Just a Little Something stamp set and die) tied on with black Baker's twine. Well, that's all I've got for you today. Just remember... everything you've seen peek of today will be available for purchase through Papertrey Ink, beginning October 15th. Hello and welcome to the fourth day of the Papertrey Ink October countdown! Today's group post is all about the new set Songbirds. What a special set! 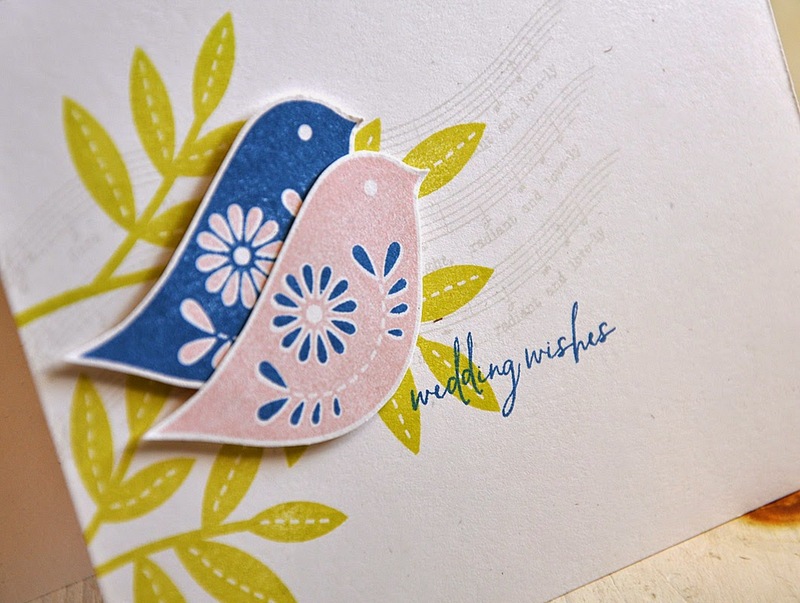 I just love how these folk-style bird are paired with songs that are suited to match a number of special occasions. It's so unique and easy to work with too! Up first are a couple Christmas projects. 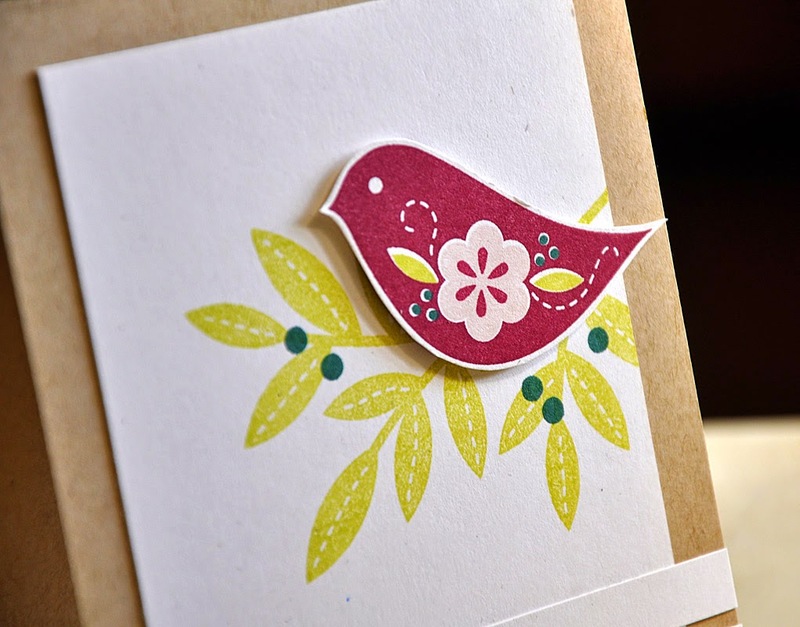 This card pairs the bird with a pretty color combo of scarlet jewel, sweet blush, limeade ice and pinefeather. 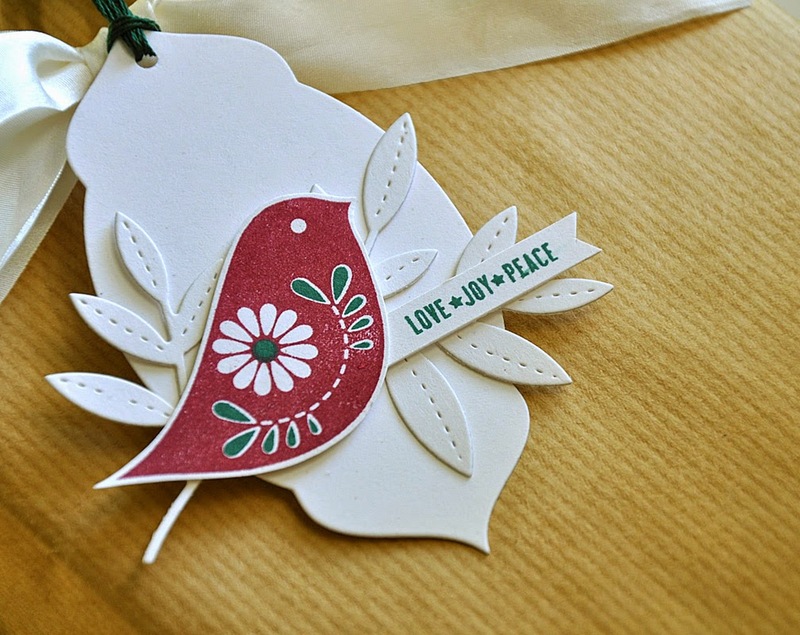 To create the perfect perch, I stamped the branch onto a rustic white cardstock block and added a few pinefeather berries. Then mounted the songbird with a few pieces of dimensional adhesive. 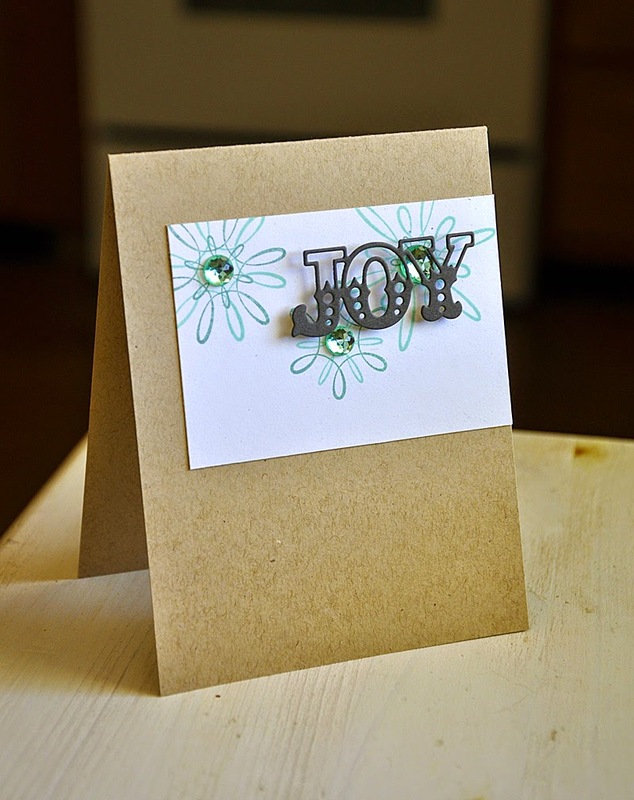 To balance out the heaving image at the top of the card I cut two strips and adhered them to the bottom, along with a stamped sentiment and two matching scarlet jewel buttons. 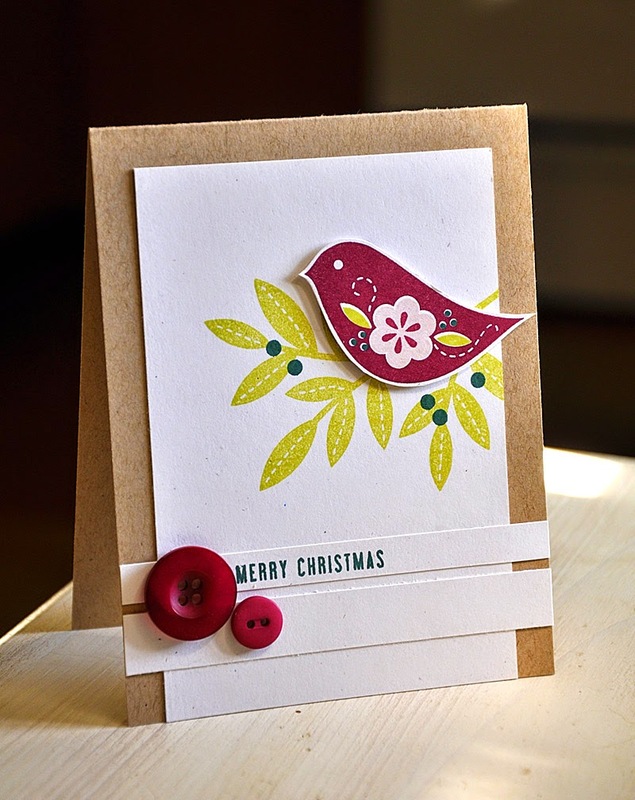 For the tag, I stamped the bird in scarlet jewel once again. This time pairing it with pinefeather and rustic white. 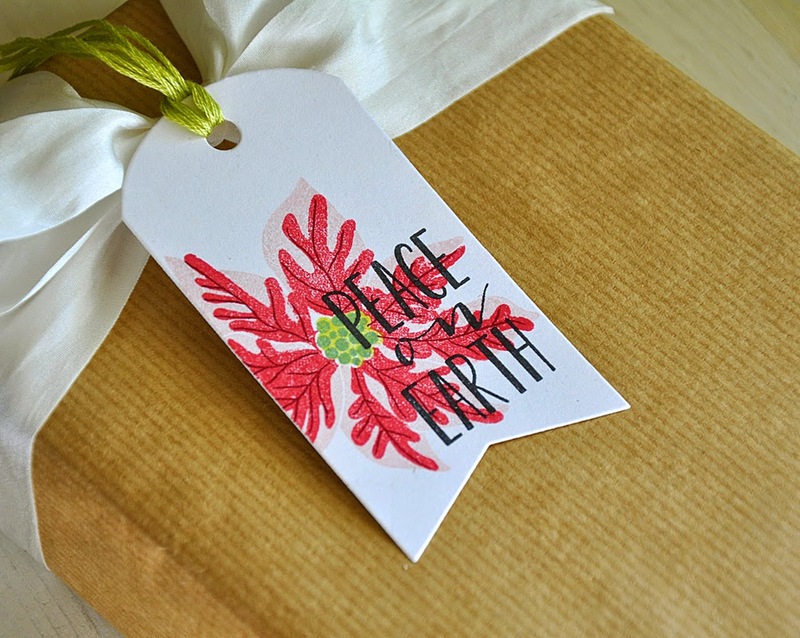 The tag was created using a label die (included in a set that you will find out about tomorrow), then topped with a die cut branch and a sentiment (from the new Snow Globe Sentiments). Another occasion this set is perfect for... a wedding! I've paired these birds up an a color combo of sweet blush and enchanted evening. I stamped the branch twice, to create a perch big enough for two. 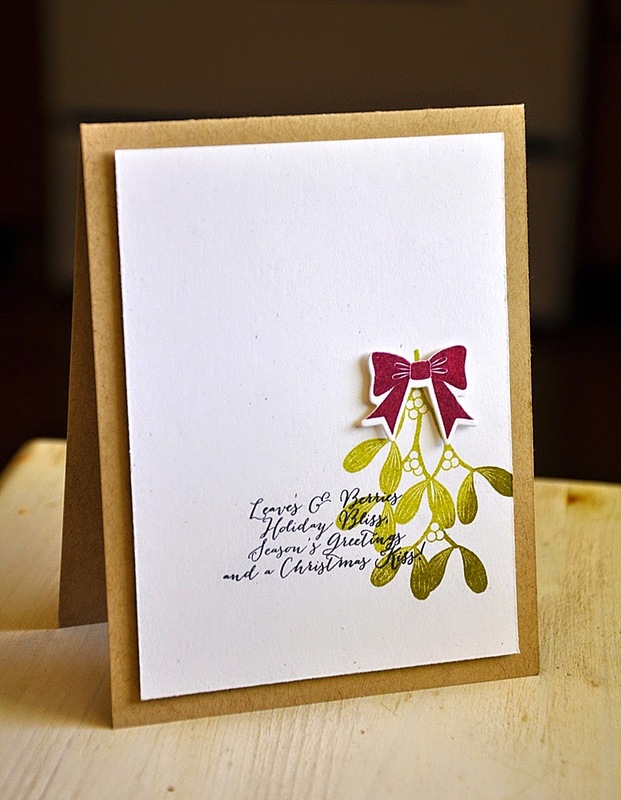 A few lines of music were stamped in soft stone and a sentiment in enchanted evening to finish this card off. Hi there! 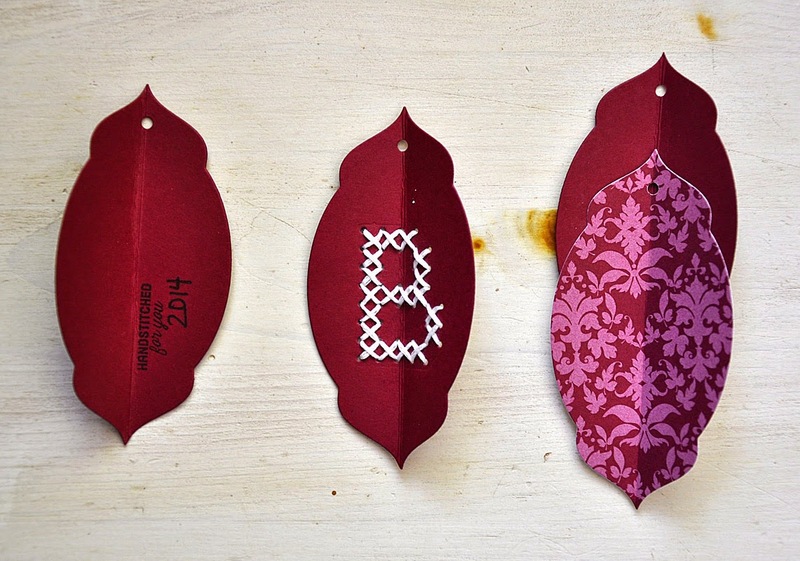 Welcome to day three of the October Papertrey Ink countdown. I'm joining the design team today in sharing sneak peeks of the new Monthly Moments: October. Octoberfest, apple picking, pumpkin picking, pumpkin carving, and harvest festivities... A few of my favorite things to do in the month of October. I love how the new Monthly Moments caters to it all! Here's a little Halloween inspiration for you today. I began by stamping a handmade pattern paper, this is the main attraction. Stamped it in a color combo of smokey shadow, plum pudding and summer sunrise. Isn't this sentiment just so much fun?! I then created a focal point using a couple other images included in this months set, stamped in coordinating colors and embellished with matching rhinestones. 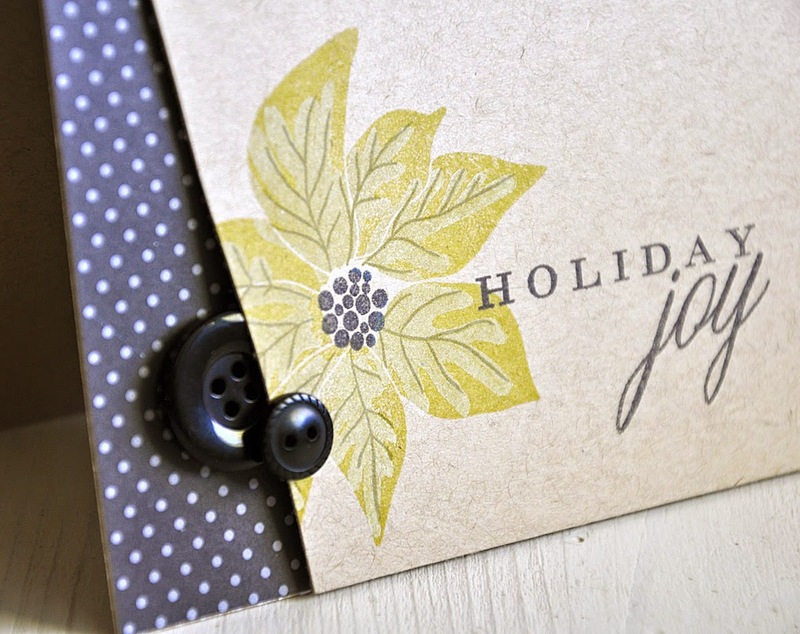 I think this layout would work for many other holidays too! Well, that concludes today's look at Monthly Moments: October. Just remember... this set will be available for purchase through Papertrey Ink, beginning October 15th. Hi there! Welcome to day two of the October Papertrey Ink countdown. 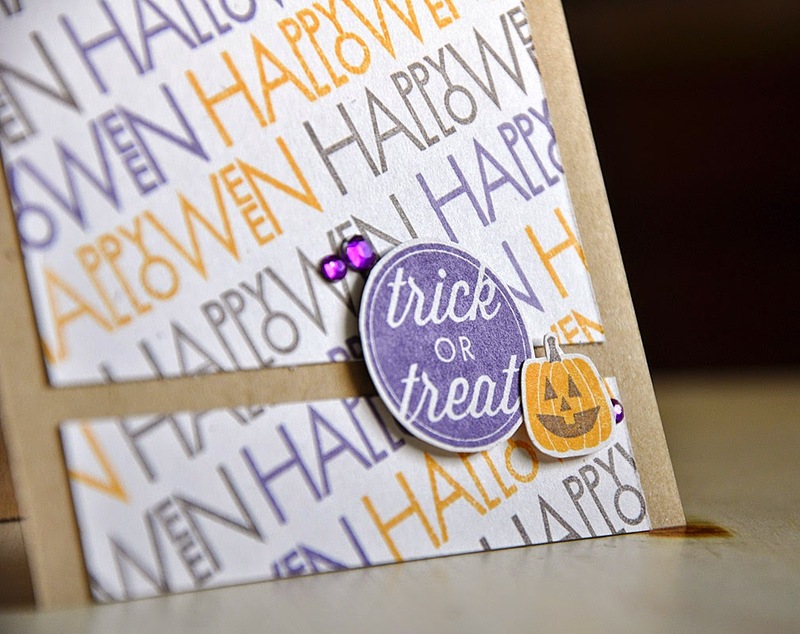 I'm here today to share a few samples using one of this months new stamp sets... Freshly Fallen. Lizzie has taken the basic snowflake and given it a fresh modern look. The pieces were designed to be layered on top of each other, rotated and mixed and matched in different colors. With dies to use as well, the possibilities are literally endless! Keep in mind that these items will be available for purchase beginning October 15th at Papertrey Ink. Plus, more info and a detail look at these items can be found on Nichole Heady and Lizzie Jones blogs today. 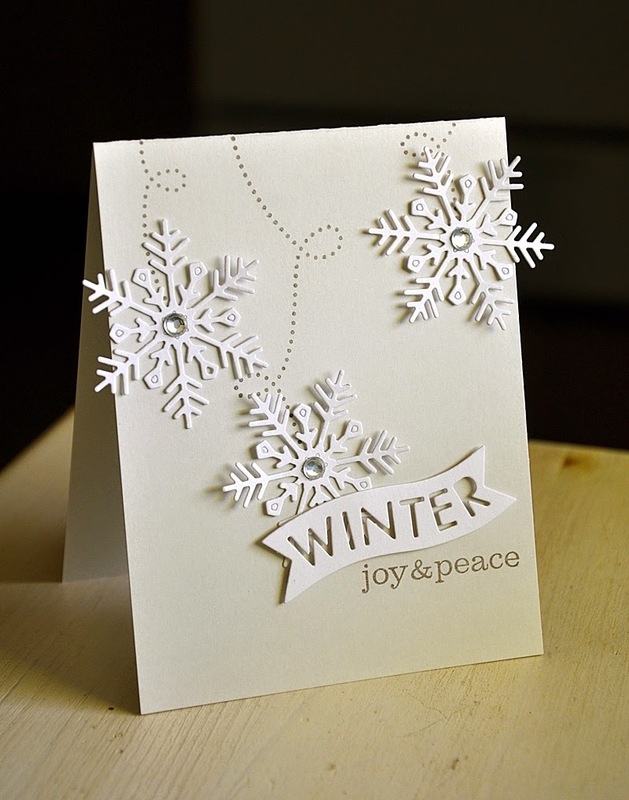 First up is a mail friendly one-layer card, stamped in a frosty color combo of hawaiian shores, winter wisteria and soft stone. 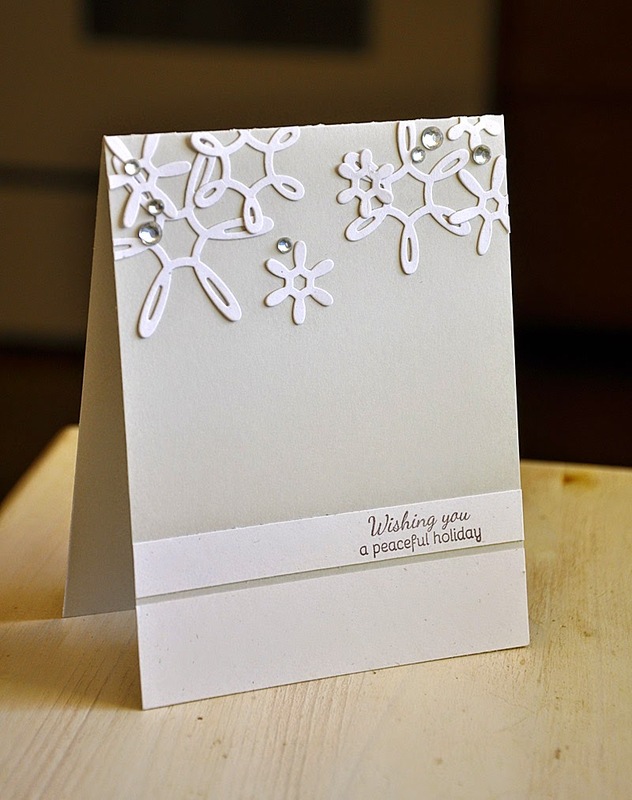 I began by stamping a freshly fallen snowflake trail, in soft stone, across the front of the card. 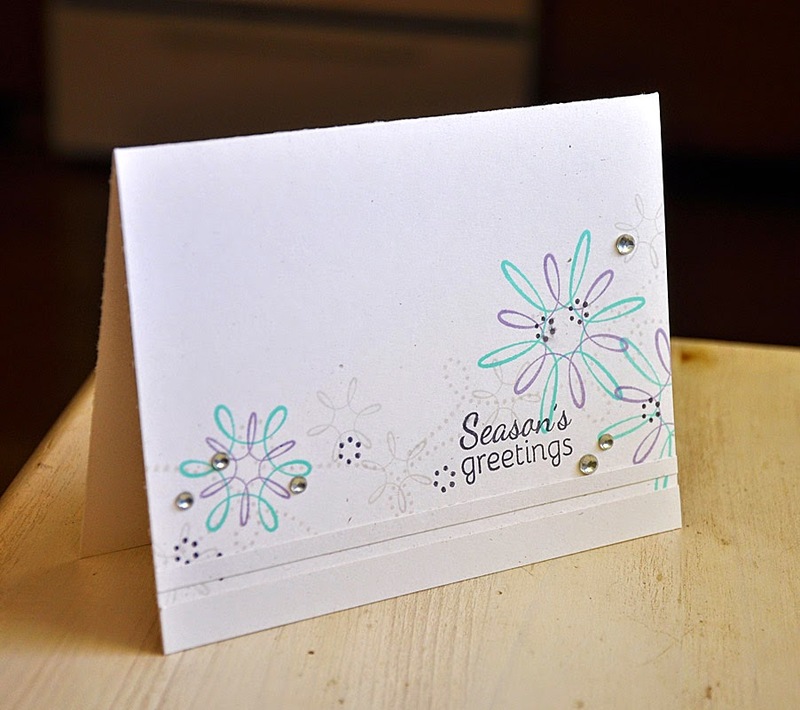 On top of that I stamped three focal and larger snowflakes in the bolder ink colors. 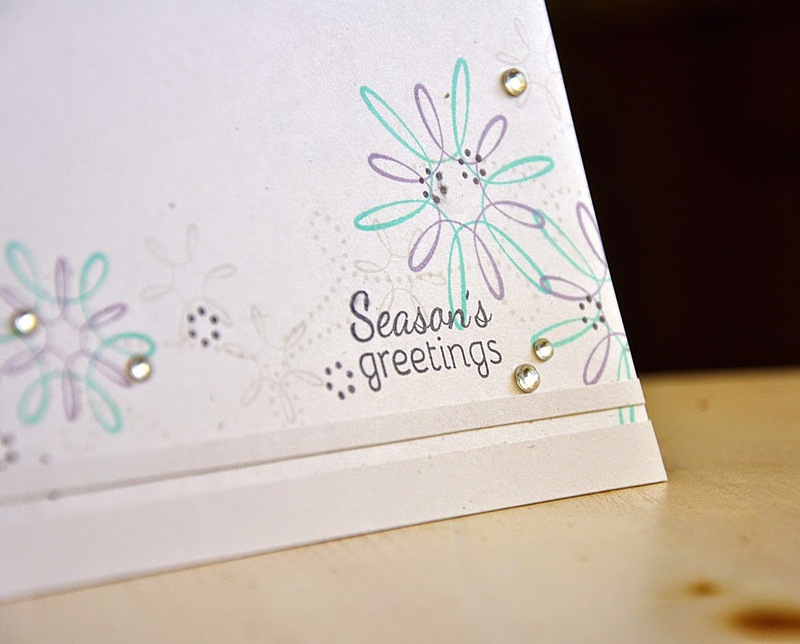 Finished the card off with a sentiment and couple cardstock strips (which were cut from the same cardstock color as the card base, creating a bit of a barely there look) and rhinestones. 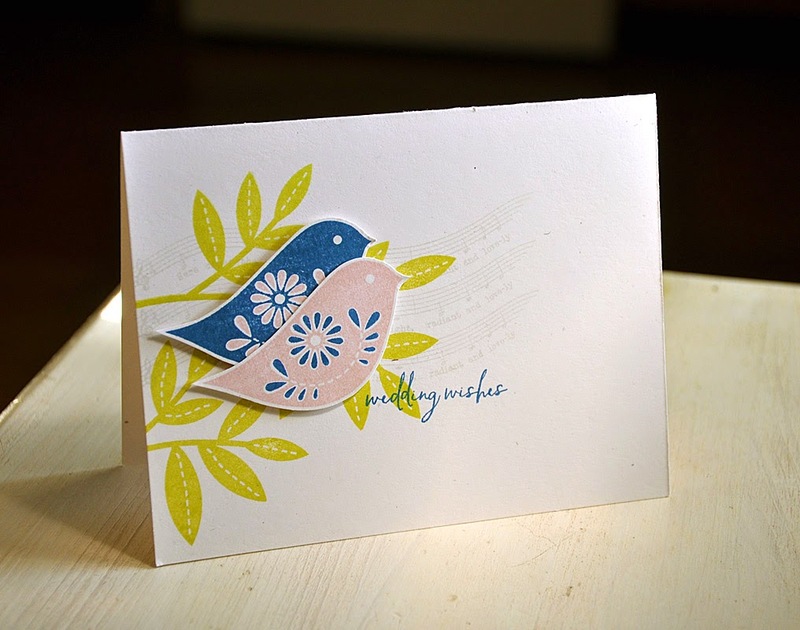 My sentiment selection was the inspiration for this next card, I went for a peaceful and neutral color combo look. 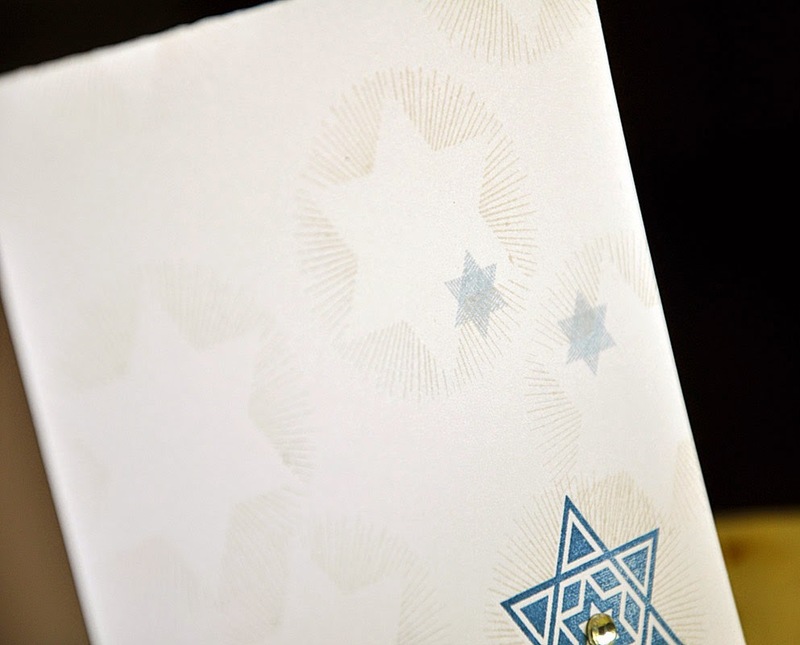 This one too is perfectly flat, making it perfect for mailing out. 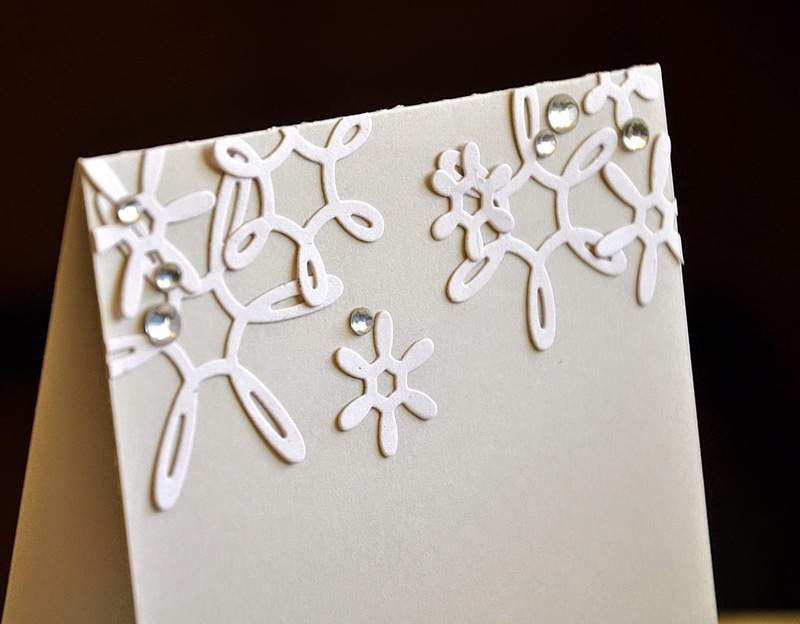 These die cut (unstamped) snowflakes look perfectly lacy and delicate, making them perfect for a peaceful holiday card approach. To top it off, rhinestones make the ideal finishing touch. 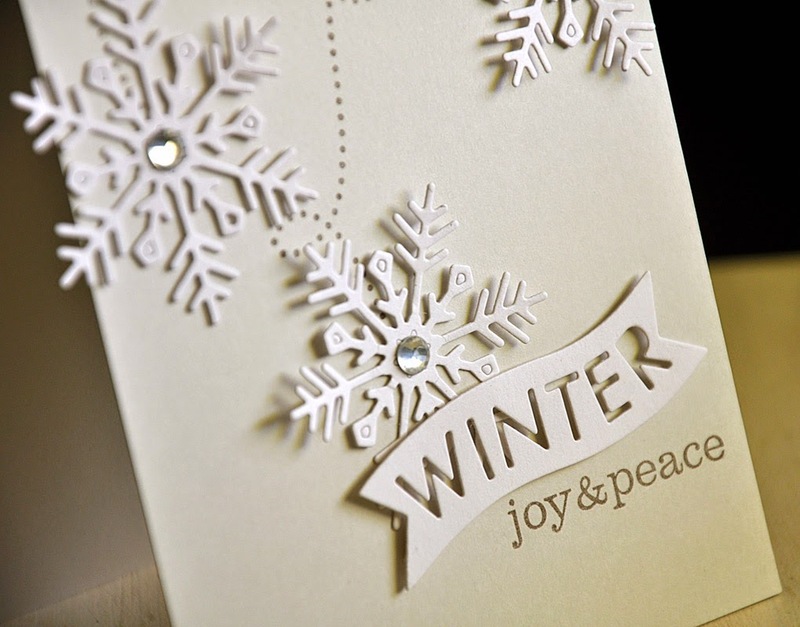 Freshly Fallen makes the perfect back drop for this die cut "Joy" (die cut using the the soon to be released Holiday Double Cuts dies). These falling flakes were stamped in a color combo of aqua mist and ocean tides. This card, as it currently stands, could be considered too bulky for sending through the post office. But this could easily be remade into a more mail friendly version by replacing the large rhinestones with a bit of glitter. Well, that concludes today's look at Freshly Fallen. Just remember... this set will be available for purchase through Papertrey Ink, beginning October 15th. Now, be sure to visit Nichole Heady for the details on today's featured new product. Pronounced (My-lee Bells). God has blessed me with a wonderful little family. I have been happily married to my loving & supportive husband for 14 yrs. God has provided him with a great job so I can stay at home with our two adorable sons.